DVD to Apple TV Converter for Mac has many settings you can customize, for example, you can set video brightness, contrast, saturation to set the output movie quality, and select DVD subtitle and audio track to convert your DVD movie in any language available on your DVD. DVD to Apple TV converter for Mac also lets you choose to convert any chapters or titles and trim the length of each title or chapter. It even allows you to join the selected titles or chapters and only output one file if you don't want to generate a separate file for every chapter or title. Besides converting DVD to Apple TV video files, This mac Apple TV Converter can also convert DVD audio to MP3 and M4A for playback on iPods or other audio players. Set video encoding settings including resolution, frame rate, encoder, and bit rate, and set audio output settings including sample rate, channel, encoder and bit rate.. Convert your DVD to Apple TV with any available language on your DVD by selecting the subtitle and audio track you prefer. Automatically convert all the files you select one by one. Adjust movie video effects by setting video brightness, contrast, saturation, and applying a special video effect. Adjust your movie to the best quality before conversion. Crop your DVD video to remove the video sides and enjoy your movies on your Apple TV in full screen. 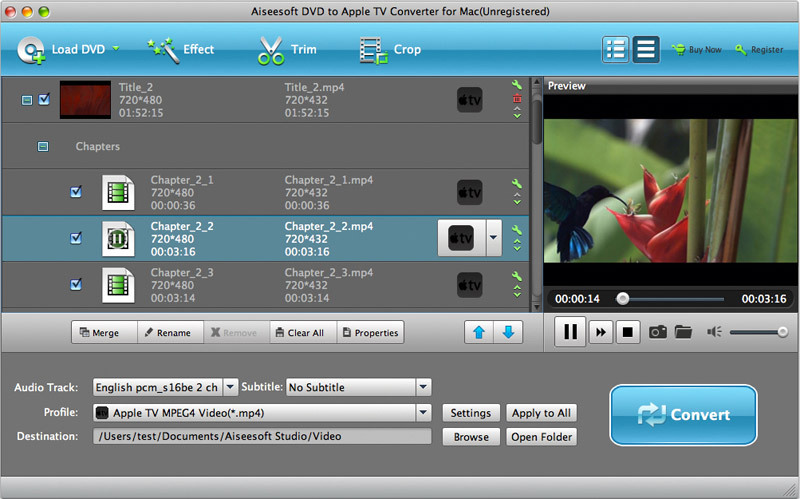 DVD to Apple TV Converter for Mac allows you to merge and convert selected titles or chapters into one file. DVD to Apple TV Converter for Mac has a very simple Mac-style interface. Converting DVD to Apple TV on Mac with this easy software is just a snap! Why Choose DVD to Apple TV Converter for Mac?